March 23rd. This is the only photo. I see minimal / non-existent wingbars, a beige vent, mostly rufous and black wings with a gray patch on the shoulder. The sides and below the vent appear to be unstreaked. The bird was in the heavy dead grassy overgrowth around an abandoned beaver pond that's slowly filling in. Lots of marsh, cattails, other swampy plants. The bird would hide in the dense grass for a few minutes, pop out and hop or flit around for up to a minute, then pop into another hidey-hole. I did not see him or her eat anything. 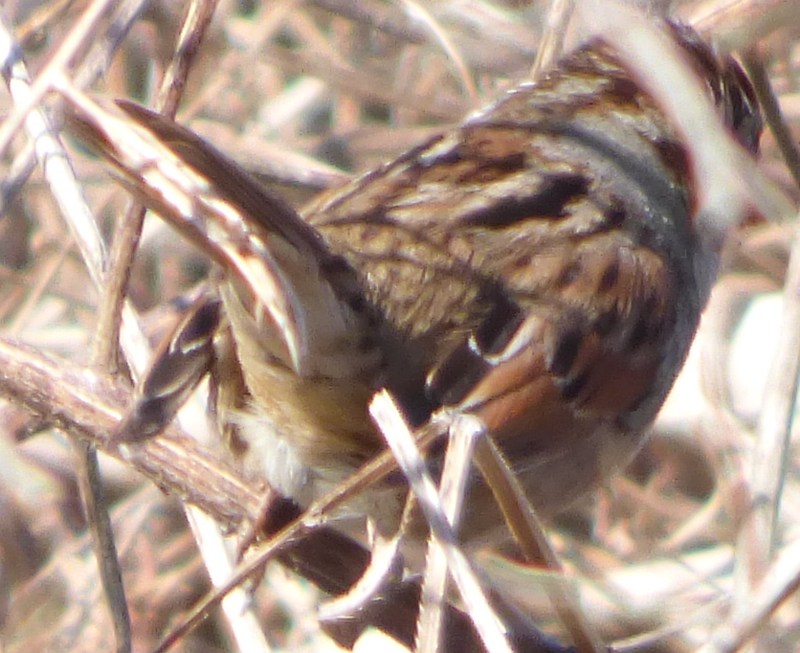 Swamp Sparrow? Is there enough here to tell? Thanks. I agree with Swamp Sparrow. Thanks. It's not a lifer, although it was the first time I've seen one at this location. This was an exercise in developing my weak Sparrow skills. Ten minutes of observation and this was the only usable photo.